My crusade continues, to get through all the peppers I bought. I deserve a gold medal because I got around to putting all the roasted eggplants and peppers in the blender, and buzzing them down. And now I have this yummy dip. Also last night I roasted three trays of peppers in the oven. You have to say this for peppers and eggplants: they cook down to nothing. You could fill your whole kitchen with peppers and roast them and you would have, oh, one medium-sized mixing bowl full. But here is something that is unlucky. The job of peeling roasted peppers. In no cookbook do I see it acknowledged, what a toil this is. Oh, I know, you are supposed to put them in a paper bag, steam them and the skins slip right off. Right. The skins do not slip right off. It is this long messy annoying job. All for your little mixing bowl full of roasted peppers! And this is what kills me. Cookbooks and cooking magazines, they always act as if things that are easy are a big deal. Things like roasting potatoes. They tell you to buy something called Simply Potatoes. Or they say "Buy pre-cut vegetables." As if chopping up a zucchini or cabbage is hard work. It is not! Then these same books just toss of roasting peppers as if it is nothing. 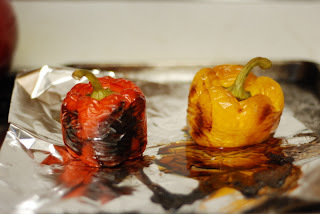 "Roast and peel peppers," they say, before proceeding with the recipe. Let me tell you, it is easier to write the authorized biography of Leonard Pennario than it is to roast and peel a few trays of peppers. Speaking of which, when I get done with this book, I will have to write a cookbook. It will tell it like it is!